When it comes to skincare, I am a creature of habit. When I find a product that works for my skin, I tend to stick with it for years. Anyone else sticks to their skincare products like that? I have quite sensitive skin and my skin breaks out quite easily if I switch up my products every so often. 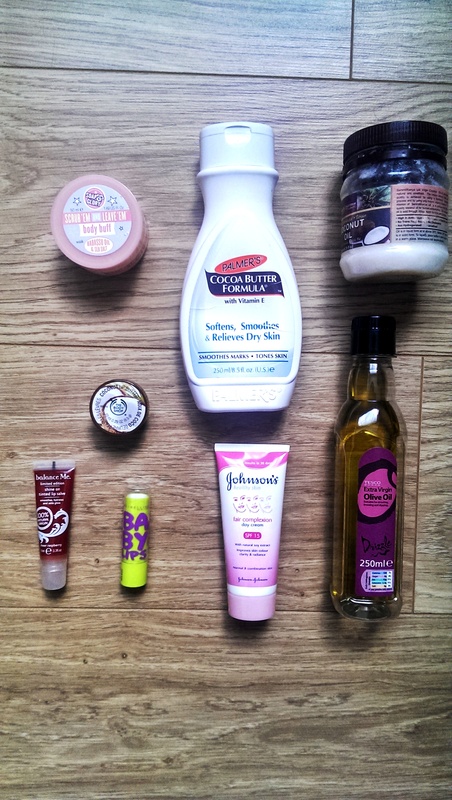 Products: Soap & Glory Scrub ‘Em and Leave Em’ Body Buff; Palmer’s Cocoa Butter Formula Lotion; Coast Coconut Virgin Coconut Oil; Tesco Extra Virgin Olive Oil; Johnson’s Fair Complexion Day Cream with SPF 15; Maybelline Baby Lips lipbalm in Minty Fresh and balanceMe shine on tinted lip salve. On a normal day, I use these products when my body is still moist from the shower. I usually cleanse my face twice a day (I usually work out mid-morning so it’s essential to get that sweat off my face) and follow up with using a face towel and pat my face dry then proceed to moisturise my lips with the Maybelline Baby Lips lipbalm and then with the Johnson’s moisturiser on my face and neck. I use the Soap and Glory body buff at least once a week to exfoliate my body and get rid of the dead skin and all that gunk. After moisturising my face and lips I usually just proceed with moisturising the rest of my body with the Palmer’s Cocoa Butter (I LOVE all Palmer’s products btw, plus I love cocoa butter for my body as it’s quite moisturising). I usually alternate between the Tesco EVOO and Coast Coconut EVCO to moisturising my feet and elbows because they are usually drier that the rest of my body. Best part about using these oils is that they are all natural and easily absorbed which is a plus. At night, I usually just take off my makeup if I’m wearing any using Simple cleansing wipes and wash my face with the cleansing bar, then take a shower and only moisturise my lips with The Body Shop Coconut Lip Butter and hop into bed. I like to let my skin ‘breathe’ at night just so that it can replenish itself and take a short break from the products I apply during the day. My skincare routine is quite simple and works for me at the moment but I’m thinking of switching up face moisturisers. Any suggestions?